Everyone has experienced it. You walk across a carpeted floor to make your exit, you grab the doorknob, and then ZAP! You just felt the shock of Electro Static Discharge (ESD). While the shock factor of ESD causes surprise and even discomfort to humans, it can cause significant damage to electronic components and equipment. Walking across a floor, however, is not the only way that Electro-Static voltage is generated. Walking on vinyl flooring, handling plastic bags or containers, working at a workstation or simply using a chair with urethane padding are just a few examples of tasks that can cause static to build. Any environment where electronics are present, is especially vulnerable to the effects of ESD. According to Paul O'Shea, Associate Editor of Evaluation Engineering, "ESD strikes quickly and silently; leaving a trail of burned-out or weakened circuits. Controlling static charge. . . is a challenge that [starts from] the floor up." A Wall Street Journal article noted a string of ESD-related incidents. In Polk County, Oregon for instance, ESD was apparently responsible for a malfunction of election-tabulation equipment. "Suspecting an erroneous tabulation, technicians advised officials to treat the carpet around the suspect computer with fabric softener. A subsequent re-tabulation proved that voters had actually approved, rather than rejected a tax increase." Recent research indicates that ESD may be responsible for more than 25% of all integrated-circuit failures over the complete lifecycle of parts in manufacturing and testing as well as in the field. (Semiconductor Reliability News, March 1993) While it is impossible to accurately calculate the cost of ESD, it most certainly runs into the hundreds of millions of dollars every year. And with the ever-growing trend toward automation, controlling this cost is critical. Adding to the complexity the situation is the fact that many equipment failures due to ESD appear as latent results. Robert F. Martin described in a 1997 Compliance Engineering article that "in these situations, device damage may not be immediately apparent but may show up later during normal operation, often as an unexplainable failure." Simply put, unprotected equipment is a blow-out waiting to happen. 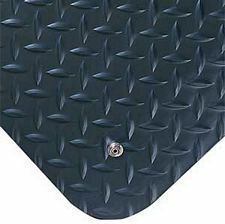 One of the most common and versatile ESD protection products is matting. ESD matting is also one of the most cost effective devices for controlling static at workstations and around sensitive equipment. In many cases there is no need to rip up subflooring or to lay special carpeting to control ESD. Because they are available in conductive and non-conductive styles to protect both workers and equipment, the simple use of a mat may be the most economical and practical protection option.